Responding to requests for proposal is hard work. An RFP is like a questionnaire. A prospective client looks for a solution to a particular problem and sends a request to several companies to find the best match. The RFP document contains product requirements, problem scenarios, questions about your company's ability to deliver a system in time and on budget, and inquiries about support options. At Magnolia we respond to quite a few RFPs. Writing comprehensive answers takes time and in-depth knowledge. The answers are out there but finding them at a moment's notice...well that's the hard part. Our partners who implement Magnolia Web content management around the globe face the same challenge. So we decided to give them a hand. I collected answers from past RFPs into a single knowledge base. I edited them for reuse and shared them with our partners on Google Docs. Partners can access the knowledge base over the web and copy text directly into their responses. Full-text Google search helps find content quickly. I further grouped answers in a particular subject area such as "workflow" together. This speeds the writing effort further since questions are bundled together the same way. 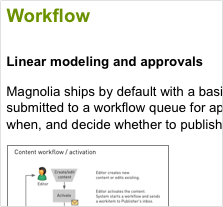 To keep the content fresh and reliable, I go through it after each Magnolia release, write about new features, and weed out any phased-out content. Want to become a Magnolia partner and grow with us?